1. Combine the soy sauce, oil, rice wine, garlic, ginger, five-spice powder, sugar and salt. 2. Mix well until sugar has dissolved. 3. Add the chicken pieces and mix until they are coated evenly. 4. Cover and keep aside for 2 hours. 5. Place the chicken pieces on a baking sheet and cook in a preheated oven at 375F for 20 minutes. 6. Remove and turn them over. 7. Cook in the oven for another 20 minutes till evenly brown. 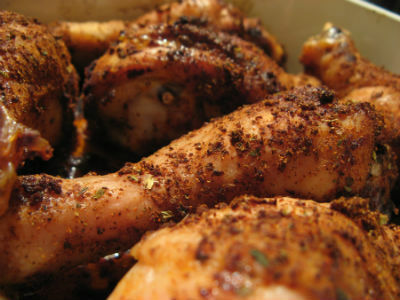 Feel free to comment or share your thoughts on this Five-Spice Roast Chicken Recipe from Awesome Cuisine.